My research is in the areas of enhanced oil recovery, decision and risk analysis, and geochemistry and flow. University of Texas Joe J. King Award for professional service, 2004. SPE DeGoyer Award for distinguished service, 2003. 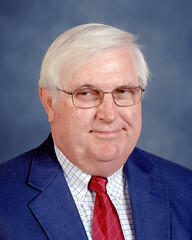 SPE Distinguished Lecturer, 1994, 2003. Texas Society of Professional Engineers Dream Team, 2001. SPE Distinguished Member, 1996, 2000. SPE Distinguished Service Award, 2000. Society of Petroleum Engineering/Department of Energy Improved Oil Recovery Symposium, IOR Pioneer, 2000. Claude and Billie Hocott Award, College of Engineering, 1999. National Academy of Engineering, 1997. Venkataram, Ashwin, Lake, Larry W., and Johns, Russell T., “Gibbs Free Energy Minimization for Prediction of Solubility of Acid Gases in Water,” Industrial and Engineering Chemistry Research, 53, 2014, pp. 6157-6968. Rodriquez, H. Martin, S. Escobar, S. Embid, N. Rodriquez Marillas, M. Hegazy and Larry W. Lake, “A New Approach to Identify Analogous Reservoirs,” Society of Petroleum Engineers Economics and Management, Oct. 2014, pp. 173-184. Adepoju, Olaoluwa, Larry W. Lake, and Russell T. Johns. “Anisotropic Dispersion and Upscaling for Miscible Displacement, “Society of Petroleum Engineers Journal, 2014, pp. 1-12. Laochamroonvorapongse, R., C.S. Kabir and Larry W. Lake, “Performance Assessment of Miscible and Immiscible Water-Alternating Gas Floods with Simple Tools,” Journal of Petroleum Science and Engineering, 122, 2014, pp. 18-30. Venkataram, Ashwin, Mark Hesse, Larry W. Lake, and Russell T. Johns, "Analytical Solutions for Flow in Porous Media with Multicomponent Cation Exchange Reactions,' Water Resources Research, June 10, 2013, pp. 3-17. Ettehadtavakkal, Amin, Larry W. Lake and Steven L. Bryant, "CO2-EOR Storage Design and Optimization," International Journal of Greenhouse Gas Control, 25 (2014), pp. 79-92. Moreno, Gustavo, and Larry W. Lake, "On the uncertainty of interwell connectivity estimates from the capacitance resistance model," Petroleum Science, vol. 1, 2014, pp. 265-271. Adepoju, Olaoluwa, Larry W. Lake, and Russell T. Johns, “Investigation of Anisotropic Mixing in Miscible Displacements,” SPE Reservoir and Evaluation Engineering, Feb. 2013, pp. 86-96. Metin, Cigdem O., Roger T. Bonnecaze, Larry W. Lake, Caetano R. Miranda and Quoc P. Nguyen, “Aggregation kinetics and shear rheology of aqueous silica suspensions,” Applied Nanoscience, published online Dec. 21, 2012. DOI: 10.1007/s13204-012-0185-6. Rai, Khyati, Russell T. Johns, Mojdeh Delshad, Larry W. Lake, Ali Goudarzi, "Oil Recovery Predictions for Surfactant Polymer flooding", 112, (2013), 341-350.